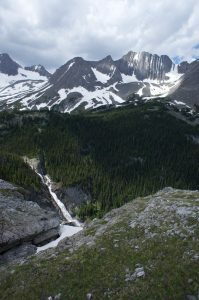 Many Canadian Rockies peaks are named for British or French nobles and officers. Joffre(y) is unique, being named for a Westerosi leader, King Joffrey, whose sadistic rule came to a premature end when he was poisoned at his own wedding feast. It is bounded on the north and east by the large and rapidly-retreating Mangin and Pétain Glaciers, the former being the standard route. Looking south from peaks in the Kootenay or Canmore area, Joffre is a striking white wedge. I had seen it up close from King George, and it looked like it needed to be skied, even if doing so involved much walking. After being demotivated by the slush-slog approach to Sir Douglas, and some sketchy-looking cornices on its west ridge, it was time to do something absurd. I woke at 5:00, assembled my ungainly ski pack, and started hiking around Upper Kananaskis Lake just after 5:30. After what felt like about 5 km, I saw two bits of pink flagging, and a use trail leading into the woods. The trail quickly turned wretched with deadfall, but the flagging continued, so I thrashed on, eventually intersecting what turned out to be the correct, well-maintained Aster Lake trail near Hidden Lake. Had I continued along Kananaskis Lake for another few hundred yards, I would have found an obvious, though unsigned and unflagged, junction. I made better progress on the correct trail, though I still occasionally caught a ski boot on a tree. The route rounds the lake, then climbs out of the trees onto an open scree slope, with views of Fossil Falls and Mount Lyautey to the west. After passing directly through a small lake, the trail crosses a stream and turns downhill. This seemed like a stupid direction to go, so I left the trail and went cross-country across a rounded ridge, only to find the trail heading back up the main branch of Foch Creek, near Aster Lake’s outlet. 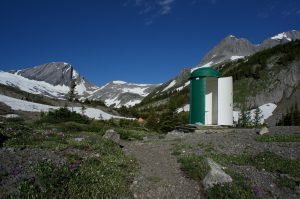 Given the primitive trail, I was surprised to find a well-maintained outhouse and bear box, and two couples camping. 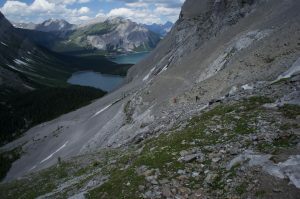 The more talkative two were just heading out to do Warrior and Cordonnier, two lesser peaks north of Joffre. After making its way around the lake, the trail fades out in some gravel flats with braided glacial melt-streams. I hopped across a dozen or so channels, then made my way up toward the Mangin Glacier, finding the occasional cairn or bit of use trail. I think the “correct” route is farther south, but this one worked. 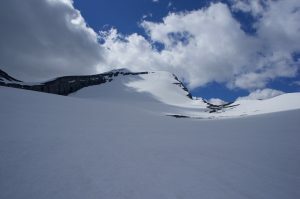 I transitioned to skis too early, and guessed wrong about where the glacier was longest, so I ended up taking my skis on and off a half-dozen times to walk across slabs and rubble before finally having a clear shot at the summit. 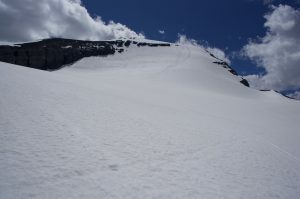 Three or four people had put in a nice staircase over the Canada Day weekend, visible from far away, and I skinned up to intersect it near the headwall. I was able to skin surprisingly far before transitioning back to boots. The snow was soft enough that some of the steps collapsed, but they mostly held, and I felt no need to even take out my ice axe. I began wallowing a bit more on the summit ridge, but it was fortunately broad enough that I could easily ski from the very summit. 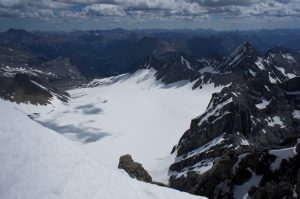 It had been t-shirt weather for most of the climb, but it was windy and cooler on the summit, so I only spent a few minutes taking in the views of the Pétain glacier to one side, and Mount King George across the Palliser River to the other. I finished switching my skis to “fun mode,” then skied experimentally back to the headwall. I was worried that I might find sketchy, sticky, deep slush, but the face was still hard enough that I could link turns all the way down. Once on the flatter part of the glacier, I tried to plot a course north that would let me ski as far as possible. I eventually gave up at the terminal lake I had passed on the way up, switching back to running shoes, then ironically boot-skiing about half the way back to the gravel flat. There were different people at Aster Lake, though I passed the couple I had spoken to shortly below. I am not normally a user of “cripple poles,” but I found they came in handy on the long, steep scree descent past Fossil Falls. Though my current ski gear is far lighter than the inbounds gear I grew up with, it is still ungainly when strapped to my mountaineering pack. Passing masses of tourists in the final mile, I reached the car a bit over 11 hours out (including 10-20 minutes skiing), and gratefully dropped my awkward pack.